Music fans, friends and musicians crowded into Chicago’s legendary Jazz Showcase to pay tribute to the one and only Fred Anderson, who passed away in June 2010 after a short illness. 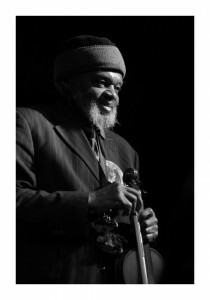 Bassist/violinist & poet Henry Grimes opened the show with an extented piece on violin. 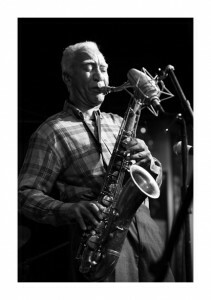 Kidd Jordan, a New Orleans native, close friend and contemporary of Fred’s, played two sets with different bands. The first featured an emotional Jordan along side bassist Harrison Bankhead and drummer Hamid Drake. 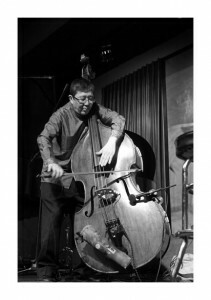 After a short intermission Kidd was joined on stage by pianist Jim Baker, bassist Tatsu Aoki and drummer Chad Taylor, all bandmates of Fred’s at one time or another. 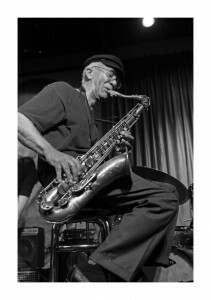 At one point, Kidd played a short piece that he had written the day John Coltrane passed away. While Kidd could not attend Fred’s funeral this past June, this was the same tune he played via the telephone to those in attendance. There were several other musicians in the house, most notibly Dee Alexander, Douglas Ewart and Billy Brimfield. All Photographs © 2011 Mark Sheldon and may not be reproduced, downloaded or used in any form without written permission. Interesting night at the Jazz Kitchen featuring Christian and his band “Inside Straight”. 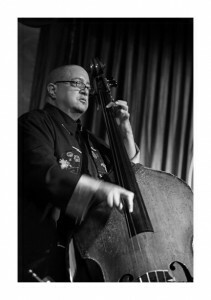 In addition to Christian, the band was to feature pianist Eric Reed, alto player Steve Wilson, drummer Carl Allen and vibraphonist Warren Wolf. Ultimately the band was Christian, Peter Martin on piano, Wilson on Alto and Carl Allen on drums. Wolf was bumped from his flight out of Baltimore, McBride drove 5 hours from STL before the show and I’m not sure what happened to Eric Reed. Allen’s cymbals were lost by the airline and he had to find a loaner when he got to Indy…. This is a great acoustic band and my preferred way to see Christian perform. The band played several originals plus some tunes by Ellington, Horace Silver and others. The image below is from the first set. 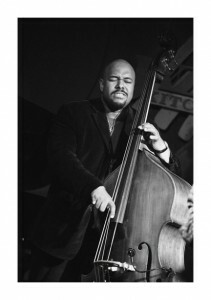 McBride looks a little like Charles Mingus in this shot. 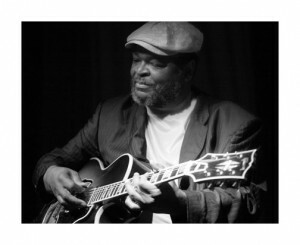 I was saddened to hear of the loss of legendary soul/acid jazz guitarist on the 13th of this month. Tragic to lose someone of his stature at the age of 64. Over his career, Melvin performed & recorded with many of the great B3 players including Jimmy McGriff, Jack McDuff, Dr. Lonnie Smith, Joey D, Reuben Wilson, Charles Earland and Big John Patton. He also performed with many other legendary artists over his 40 plus year career including Sam Cooke, Lou Donaldson, Houston Person, Johnny Lytle, Idris Muhammad, Bernard Purdie, Hank Crawford, Red Holloway, Alvin Queen, Sonny Stitt and vocalists Etta Jones and Jimmy Witherspoon. 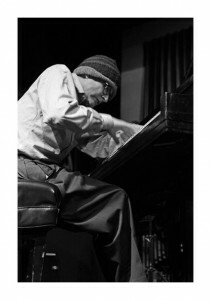 The photo above was made in a May 2006 performance at The Jazz Kitchen in Indianapolis. You are currently browsing the No Room For Squares blog archives for March, 2011.